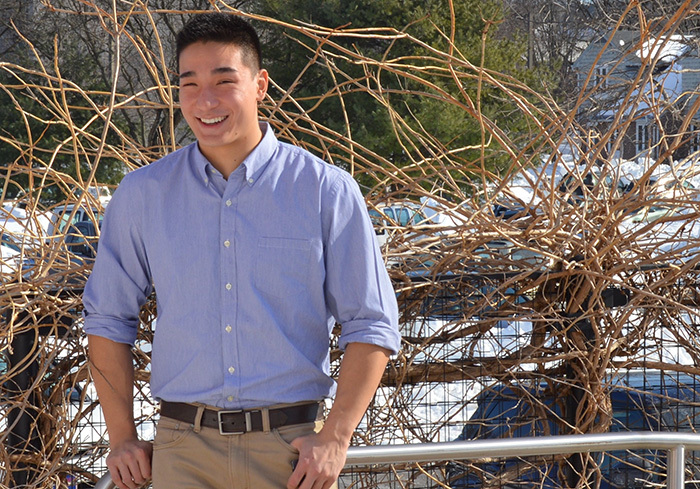 Varsity football player David Chow ’16 combined his passions for psychology and biology—and got some valuable leadership experience—when he led a team of student researchers examining how feedback and goal-setting affects performance on the field. This spring, he will co-present the group’s findings at the Eastern Psychological Association’s annual meeting in New York City. Born and raised in Germany, Chow discusses what being a Red Devil has taught him; his fascination with learning how the mind and body work; his plans to enter medicine; his internship at a cancer center; and the extracurricular activity that’s provided him with travel, leadership opportunities and a wide circle of friends. Varsity football, Pre-Health Society, student interviewer and service trips. Human Intelligence by Klaus Marre. In high school I took AP psychology and AP biology, both of which I found fascinating. I like learning about how the body and the mind work. I could not decide if I liked biology or psychology more, so I decided to major in both. I wanted to go to a small, liberal-arts college, with strong academics, where I could play football. The people that I met on my visit were what set Dickinson apart from similar schools. Everyone I met was open, welcoming and passionate. I remember meeting Keith Fischer ’02 after my info session; he told me about his experience at Dickinson. From that point on, I knew that if I only had half the experience he had at Dickinson I would have an excellent time. Toasted croissant with butter and Nutella. There are so many great professors at Dickinson. One of my favorites is [Associate Professor of Psychology] Suman Ambwani. Last semester I took a psychology seminar with her, and we learned about the biopsychosocial perspectives on disordered eating. What is so great about professor Ambwani is that she is incredibly knowledgeable in her field and she sets high expectations, which helped me get the most out of the course. She also makes an effort to get to know her students and values their opinions. I've been on two service trips [to South Carolina and Georgia] so far at Dickinson, and now I have the opportunity to lead a third service trip this spring. I must say that Dickinson service trips have been integral to my Dickinson experience. Not only do you get to help a community in need, but you also get to know fellow Dickinsonians who you may have not met otherwise. Being part of Dickinson service trips has opened my eyes to the great community of talented, engaged and passionate people at Dickinson. … a photographer for National Geographic, so I could travel to cool places. It is very important to be a balanced person. While academic success is a priority, it is equally important to be engaged with other activities. Dickinson offers a wealth of learning experiences outside of the classroom. I love to cook in my spare time. My dream is to have a career in which I can help people. Right now my plan is to attend medical school and become a doctor. Last summer I did an informal internship at the City of Hope in Duarte, Calif. The City of Hope appealed to me because they focus on cancer research and treatment, which is applicable to my interest in the medical field. My experiences there made me realize that research is not an exact science. The more we learn about something, the more we realize how much we don’t know. During the fall semester I researched how private feedback and goal-setting affects the performance of football players. I took on this project because it gave me an opportunity to do psychology research while potentially helping the football team to do better. This experience taught me how rewarding research can be. My research team and I spent many hours analyzing practice film, and in the end we were able to find some promising results, which we will present at a conference. Playing football for four years at Dickinson. Because football pushed me to my physical and mental limits, I learned a lot about myself. … everyone would be able to attend a great school like Dickinson.